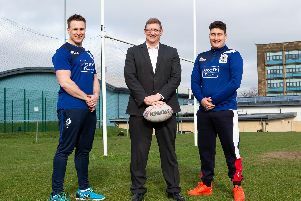 Old Crossleyans revived their Yorkshire One promotion bid, after successive defeats at the start of 2019, with a 41-0 home win over Selby on Saturday. The visitors arrived armed with the powerful scrum that had dominated the Crocs earlier in the season but they were put in their place with captain Martin Hamer scoring a hat-trick for the hosts. Crocs dominated possession and territory in the opening 10 minutes, accurately moving the ball from wing to wing, and that formed a template for much of the game. A Raman Sembi catch at the tail of the lineout set a platform for the backs to attack and Freddie Walker beat defenders to go close. Three phases later Jack Pilcher rumbled over for an unconverted try. At the first scrum things looked ominous for the home support as Selby again bossed the set piece. However, the visitors were repelled and by the time Richard Wheale was introduced to the action it was the home side’s turn to disrupt the Selby scrum and force a turnover. Joe Gallagher made a classy line-break, stepping three defenders, before Billy Hammond put Rob Oliver in space to sprint 40 yards, only to be tackled agonisingly short of the line. The ball was recycled quickly and Gareth Sweeney off-loaded for Hamer to touch down wide out and double the lead. It took nearly 30 minutes for Selby to create multiple phases of play, but a disciplined home defence yielded neither territory nor points, only turnovers. Gallagher’s tactical kicking repeatedly relieving pressure and dictated play. From another Sembi lineout, Gallagher and Billy Hammond combined to create another try scoring chance, which went begging, although man of the match Gallagher converted a good penalty to extend the lead to 13-0. Strong carries from Jack Pilcher and George Hammond created pressure and Gallagher kicked another penalty. The home side’s accurate lineout created large periods of Crossleyan possession. After persistent offsides, the referee lost patience, issued a yellow card and Gallagher accepted another three points from 40 yards. An accurate long pass from Gallagher found Josh Hunt at pace and he unselfishly put Hamer in for his second try to make it 24-0 at half time. A reinvigorated Selby pack established a base deep in the Crossleyans half, but were thwarted by a Chris Vine steal and run. The scrum half turned defence into attack as he put Ian Davies into space. Davies, who was having another strong afternoon, recycled quick possession, and Gallagher found Hunt with a clever inside ball. The fullback scorched through from 40 yards out, stepping his opposite number to go under the posts for a converted try. Jack Hammond’s outrageous dummy was followed by a strong fend to send Hunt over once more, but the referee called play back for a disputed forward pass. Vine made 70 metres from a quick tap penalty but Selby relieved pressure and then enjoyed their best period of the match but the home defence held firm. An altercation led to Wheale being red carded. Walker made a run and combined well with Pilcher to set up Hamer for his third try and a 36-0 lead. Hard work from Pilcher then set the platform for Billy Hammond to cross in the closing stages.